SEMCOR provides a wide range of innovative fluid handling products and services to companies throughout the Midwest. Our expansive 35,000-square-foot facility is centrally located in St. Louis, MO, enabling us to provide prompt, efficient service to companies in Missouri, Kentucky, Iowa, Illinois, Indiana and beyond. We supply slurry valves that provide an extremely effective means of controlling liquids containing suspended solids. Slurry can be roughly defined as any material primarily consisting of liquid that is composed of more than 10% solid materials. Slurry valves are mainly used to control the flow of slurry in applications such as hard rock, potash mining, smelting and processing, sand and silica, power generation, wastewater treatment and many others. 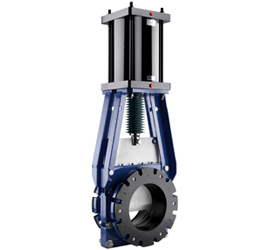 As part of our ongoing quest to provide only the best fluid handling products for our customers, SEMCOR specializes in offering top-performing slurry valves from ITT Engineered Valves. Choose from a wide assortment of slurry valves for medium to heavy-duty applications. Our knowledgeable sales and service staff can help you select the right slurry valve product for your needs. Our close partnership with ITT Engineered Valves also enables us to provide the highest level of technical support for your slurry valve. We invite you to browse our current slurry valve product offerings and take a close look at the product specifications. You can also contact us to request additional product literature and send inquiries regarding any of our products and services.